Pink Lemonade: Six Fun Tips for a Fit Family! Six Fun Tips for a Fit Family! The new school year is quickly approaching, which means less downtime for kids and more stress for parents. To make matters worse cutbacks in physical education, increased academic pressures, and ever-growing portion sizes in restaurants and at home are making families increasingly overweight. But who says you can’t make more time for the family and squeeze in a decent workout? The trick is to do both at the same time. Tara Zimliki, fitness expert and founder of Tara’s Boot Camp in Branchburg, New Jersey, teaches people every day how to maintain healthier lifestyles, no matter what their age or fitness level. Using her own family as an example, she helps families improve both their health and their confidence. “By making a commitment to family fitness, you can strengthen bonds and get yourself in shape, too,” says Tara. There’s also the added benefit of setting your kids on the right path for later in life, when being fit will lessen the risk of diabetes, some cancers, heart disease, osteoporosis, and depression. · Get animated. Running doesn’t have to be boring! Get creative with your workout. Form a conga line and play follow the leader. Flap your arms whenever you see a stop sign. 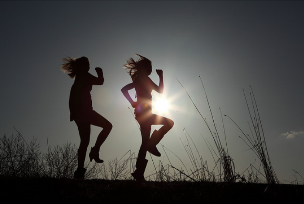 Try running while hopping, pumping your arms, playing air guitar — whatever you and your kids can dream up! · Be a cheerleader. A recent study of 200 students in grades 2 through 11 showed that kids of all ages want their parents to help them stay active. Cheer them on frequently and show your child that activity is a priority every day. Tara says to make sure your children know that you would never be disappointed with their performance. “Remember, this is both a workout and a bonding activity,” says Tara. · Use community resources. Your family run doesn’t have to be confined to your block. Keep it interesting by visiting different parks or neighborhoods other than your own. You can also check out whether your child's school, or a local university or community center, offers an indoor or outdoor track for public use. · Be vigilant. Although a family jog provides a convenient way for you to get out the door and run, the advantages don’t come without risks to your child. Try to avoid running at night when visibility is limited. “Your exercise should be satisfying and safe for both you and your new companions,” advises Tara. Also, leave distractions at home – including the iPod and the dog. Make this time simply about you and your kin. Tara is a Certified Personal Trainer through The American Council on Exercise (ACE), and a Boot Camp Instructor. She has competed and trained with top athletes at the University of South Carolina where she was awarded a full cross-country scholarship. Tara has a B.A. from Rutgers University and specializes in fat loss and nutrition. She is passionate about helping people change both body and mind, believing positive results stem from positive attitudes. She helps clients maintain this attitude with fun, challenging and rewarding workouts. Tara’s love of fitness started as a child when she began running at the young age of 7. She played numerous sports but running was her passion. Tara enjoyed it so much that she continued running right up until she had children, completing the New York Marathon 8 months pregnant and even ran 1 mile the day she gave birth to her first daughter and 3 miles the day she gave birth to her second daughter. Tara has completed 15 Marathons and hundreds of races worldwide. In addition, she has won many 5Ks and placed top in many long distance runs. In 2008, Tara placed in the top 500 women for the NYC Marathon. Recently, she won the USATF New Balance Long Distance Grand Prix for women 34 & under for the 4th consecutive year. Tara’s practices what she preaches in all aspects of fitness and health and for this reason she is a trusted trainer that produces results. For more information on Tara’s Boot Camp, including registration details and full schedule, visit http://www.tarasbootcamp.com/.